Shade Your Stream is a campaign to encourage landowners to plant or maintain woody plants along streams on their property. The plants’ roots hold soil in place, preventing erosion, while branches and leaves shade the stream, helping keep water temperatures cooler and more favorable to fish and other aquatic animals. The end result is that simply by planting trees and shrubs, landowners improve water quality and stream health. 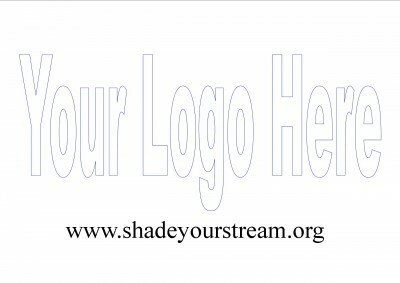 Though created and first implemented in the Little Tennessee River basin of Western North Carolina, Shade Your Stream is currently being used by local watershed organizations across Western North Carolina. Implementing the campaign is typically a three-step process, 1) generating landowner interest, 2) passively providing information to landowners, and 3) actively engaging and teaching landowners. Entries should be a 6” x 6” jpeg, 300 dpi. Winner must provide final logo as a vector file. One logo will be selected by a team of stream conservation and environmental education professionals from across Western North Carolina. The creator of the winning entry will be notified by July 1, 2016. The creator of the selected logo agrees to work with the selection committee to apply minor adjustments to finalize the logo. If this is not possible, another entry will be selected. Winning entry becomes the sole and exclusive property of Mainspring Conservation Trust, Inc., including all rights for use, display, copying, publishing, etc.